Welcome to another edition of the Wigwam Fishermans Blog. This past weekend I had the opportunity of fishing with a few of my close family members, and the weather and fishing didnt disappoint us, praise the Lord. On July 3rd we embarked on our fishing excursion with a few Lake of the Woods first timers, and as it has all summer long, it produced a number of fantastic Walleye for us to view, picture and even a few to feast on. I just wanted to thank all my family members that made the trip form many miles away to visit us and share with us the beauty of Lake of the Woods over the 4th of July weekend. Thanks again and I look forward to seeing you all back in the very near future. haha. Even with the quickly rising water levels and the sub par conditions, because of some mucky water, the Walleye bite has never been better. I hope that many of you will have the opportunity to experience what we are experiencing on a daily basis up here right now. There is still plenty of summer left to enjoy, and if you havent had the time to sneak up here, just make it happen. The fishing has never been better on a day in and day out basis in my 18 years on Lake of the Woods, the Walleye Capitol of the World! If you havent become a fan of the Wigwam Resort-low on Facebook, what are you waiting for? Im posting on there daily and have found it a great way to communicate with everyone on a regular basis. I will be posting all of our weekly meal specials and drink specials on there also. Take advantage of Facebook and everything it allows you to do. We look forward to having you as our friends on Facebook. Also, we have just received a new stock of hats (seen pictured here). If youd like to have the new Wigwam hat, and you dont think youll be able to get back to see us soon, just give us a call and you can purchase the Wigwam hat over the phone (800) 448-9260. We will package and mail your order promptly. If youre looking for an affordable vacation this summer, at a first class fishing resort, youve just found it! For additional information, please call one of our knowledgeable staff members at (800) 448-9260, and start your journey to the Walleye Capitol of the World! Ill give you all the hard facts as soon as I find out where theyre hiding next. Good luck and Happy Fishing to all! 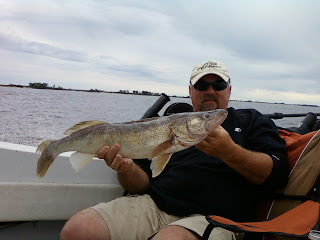 Thanks for fishing with us and visiting with us at the Wigwam Resort on Lake of the Woods. My shout out today will go to Bob and Wendy Barutt from Melrose, MN. 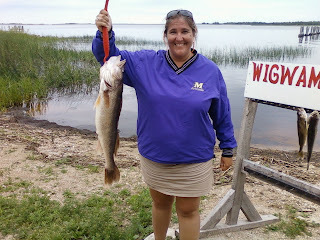 They were visiting us this week and fishing with Kevin Tall Tale Olmstead when Wendy hooked into a beautiful 30 ½ Walleye on July 5, 2010, which will now go on their wall at home. I know from talking to you both that Bob wanted to take a little credit for the catch, but Wendy this one is all yours. Thanks for giving the Wigwam Resort the opportunity to have you as our guests over our countries Independence Day. Congratulations on this awesome catch and I hope you guys had a great time and we look forward to seeing you back this winter or even sooner! Happy Fishing to all, and to all a good day! Bragging may not bring happiness, but no man having caught a large fish goes home through an alley.